Last month my mother-in-law on a whim decided to give me an Aristo 414 Chronograph that she had acquired for $5 at a yard sale earlier in the year. She had already given me "The History of the Swiss Watch industry" as a present so this was a nice bonus gift. Neither of us had heard of Aristo before so I did some light research, which got me thinking about other watch brands that either fell to the wayside or into obscurity during the quartz crisis and were not fortunate enough to pick up again in the early nineties. To me, the most known unknown brand of this type is Universal Geneve, formerly one of the biggest players in the watch industry, but which is now forgotten about to anyone outside the watch community. Founded as Universal Watch in 1894 by Numa Emile Descombes and Ulyesse George Perret, Universal remained a family business up until 1967 when they were bought out by the Bulova group. Universal were the first company to produce a wrist-worn chronograph in 1917 when the notion of a timepiece worn on a wrist was still a novelty amongst gentleman of character. There were many classic watches released by Universal Geneve, however I shall focus on just three: the Compax, Tri-Compax and PoleRouter. Three fantastic Universal Geneve Compax, "Evil Nina" Ref. 885103/01, "Nina Rindt" Ref 886103/03 & a fantastic blue combination. Photograph by William Bright. First introduced in 1935 as an extremely precise (1/5th of a second) chronograph with a 12 hour register, the Universal Geneve Compax is one of the company's most celebrated watches. Produced for over forty years, there were multiple variants and designs befitting of the changing styles from earlier classic dress chronographs to the sports chronographs of the 60's and 70's, which are the pieces now most desired by collectors. The two pieces that are the most desirable are the "Nina Rindt" Ref. 885103/03 and the "Evil Nina" Ref. 885103/01 which were often seen on the wrist of the eponymous Finnish supermodel and widow of Jochen Rindt: the only man to have won the Formula 1 Championship posthumously after dying during in an accident in the 1970 Gran Prix. Never let it be said that watch enthusiasts are unimaginative as the reasoning for the name of the "Evil Nina" is that it has a black dial whilst the standard Nina has a cream dial. Both of these watches have the same case with these wicked "twisted" style lugs that scream seventies cool alongside the thick rectangular minute and hour hands. They are powered by the superb workhorse of late sixties chronographs, the Valjoux 72 movement, which was also featured in another classic chronograph of the time, the Rolex Daytona. Back in December, Analog/Shift had an "Evil Nina" for sale at $12,000 and even went as far as to say that for every hundred Paul Newman Daytonas you'll find only one Evil Nina! Luckily for me I actually prefer the Ref.8851303 "Nina Rindt" which of the two thankfully costs marginally less. I like the contrast of cream dial against the tachymetre bezel and sub dials with those rectangular hands, so cool! There are more "budget" options available for different variants of the Compax with a blue dial/white sub dial combo being sold over at 1stdibs for around $4000 and over at Chrono24 the price starts at around $2000 for steel and goes up in price with rarity and use of precious metals. Coinciding with the brand's fiftieth anniversary and 10 years after the first release of the Compax, came the Tri-Compax in 1944, a dress chronograph featuring a triple calendar and moonphase which even today remains one of the brand's most complicated watches. This time period is a goldmine of complicated watch design and Universal Geneve knocked it out of the park when it came to the Tri-Compax. Now I've gone on record as saying that I think it's nigh impossible to make a calendar watch without sacrificing legibility or cluttering the dial, but UG managed to do the impossible and designed a layout that is not only attractive but also functional in case sizes ranging from 33mm to 37.5mm. The moonphase at 12 o'clock overlaps the 12 numeral allowing for extra room with the date dial running around the outside of it with two perfectly sized rectangular apertures just to the left and right revealing the day and month. It has been said that UG, specifically the Tri-Compax, is just a poor man's Patek and I feel that this is mostly unjustified. It's true that during the 1950s both Patek and Universal were distributed together by the Henry Stern Watch Agency and UG's lower price and prestige could conjure up a relationship similar to that of Rolex and Tudor, with UG perpetually being the baby brother. In fact Benjamin Clymer over at Hodinkee briefly compared the Patek 1518 to his own Universal Geneve Tri-Compax, pointing out that the UG had only a simple calendar whilst the Patek was perpetual and also cost nearly hundred times as much! Whilst I'm sure every watch company executive secretly (or perhaps not so secretly) wishes that their watches are as successful and revered as those of Patek, I don't think Universal ever attempted to be anything other than themselves. Back in February New York-based watch sellers Vesper & Co had an exquisite Tri-Compax Ref. 22242 for sale and it is an excellent example of the fact that Universal were not slouching in either design or the manufacture of their watches. An earlier model featuring a snap back case, rather than screw in, and rectangular pushers rather than circular, Ref. 22242's dial has aged beautifully and seems like it has barely had any wrist time at all. Yes, the movement is gold plated not solid gold but it is still a thing of true beauty. I'm not the only one to appreciate a Tri-Compax as President Truman wore his solid gold UG at the Potsdam Conference in 1945. If it's good enough to wear whilst negotiating the end of World War 2, then it's good enough for any occasion. On the 15th April 1954, the Scandinavian Airline System (SAS) flew its first commercial flight over the North Pole in efforts to reduce flight times from Europe to California. All the pilots were issued with Universal Geneve Chronometers chosen for their anti-magnetic capabilities for fear of lesser pieces being influenced by the magnetic field emanating from the North Pole. UG had a twenty three year old Gerald Genta (who later in life would design both the Audemars Piguet Royal Oak and the Patek Philippe Nautilus) design a watch to honour (or capitalise on..) this achievement of aviation, thus the Polarouter was born and was fitted with the same bumper movement as the SAS pilots watches. After the initial success of the watch it was renamed the Polerouter and fitted with a brand new calibre, the 215, which was the first microrotor movement. Rather than having a rotating mass above the movement, it was actually incorporated into the design of the movement making the watch significantly slimmer. It should be noted that, as always in the watch industry, there is slight contention as to who developed the microrotor first as the Hamilton/Buren company had also been developing a microrotor (dubbed the Planetary rotor) which would be used in their Thin-o-matic line. Hamilton/Buren indeed patented their design in 1954 whilst Universal Geneve eventually secured a patent for their design in 1958, which would lead you to believe that they were second, however they had been releasing their movements with "Patent Rights Pending" written on the underside of the rotor since 1955. Over the years there were many version of the Polerouter, released with and without the microrotor, and the most desirable of these today are the original watches issued to SAS pilots and the Polerouter Sub. 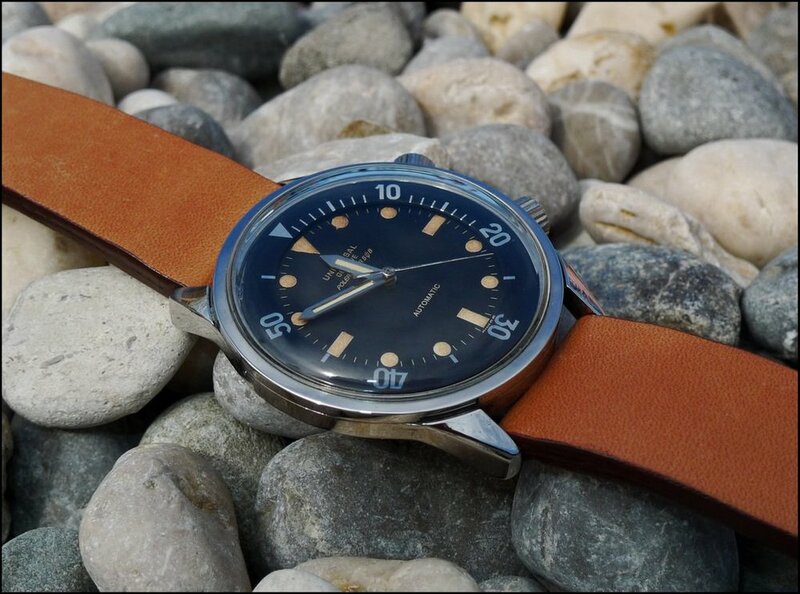 The Polerouter Sub was a dive watch released in 1961 and was the only Polerouter to have the super compressor case found in other such legendary dive watches manufactured by Longines, Jaeger LeCoultre and IWC. The case designed by Ervin Piquerex S.A. was a unique alternative to standard case design when it came to increasing the durability and water resistance of dive watches. Rather than a standard case back which exerted constant pressure on the O-ring seal, a super compressor case was designed so that its case back would exert more and more pressure the more water pressure that it encountered the deeper the diver swam. As the case back wasn't constantly pressing on the O-ring it was intended to increase the life expectancy. Whilst there were single crown variants of a super compressor case, the most iconic is the double crown, one at two o'clock for rotating the inner diving bezel and one at four o'clock for winding the movement and changing the time. It shouldn't be a surprise that a unique and functional dive watch intended for professional use and abuse is highly desired by today's collectors and finding an original and complete Polerouter Sub is hard to find amongst the foray of frankenwatches that litter the internet. So what is next for Universal Geneve? Well the company still technically exists but hasn't produced anything since 2008. Sold to Stelux, a Hong Kong investment group, in 1986 Universal did relaunch itself in 2001, however its new life was short lived. The Universal Geneve website hasn't been updated since 2008/9 and its only listed distributor is Thong Sia Watch Co in Hong Kong, who don't even mention UG on their website. I've looked through the last annual report of Stelux and they still own 100% of Universal and seem content to let it languish in obscurity collecting dust. Interestingly enough, Stelux also own Cyma SA which are still producing watches. The cliche answer is that "only time will tell" what will happen to Universal, but I'll try to be more definitive in my answer. I imagine that for the next five or ten years (maybe even longer) they will continue to be shelved by Stelux until enough time has passed since its ill fated re-launch for another investor to purchase the company and attempt to breathe life back into it. I would hope that whoever takes them on does gamble and attempts to create pieces like the Tri-compax again, however I wouldn't be surprised if they become a "heritage brand" like Longines, recreating classic designs with ETA Movements and an entry/general consumer price. Whilst I'd prefer the gamble, I would take anything rather than have them slowly fade away from memory. Ten years ago no-one would have expected a revival of Tudor to be successful (perhaps the greatest comeback since Lazarus?) so perhaps 2025 could be Universal Geneve's year? I truly hope so.